Daanet has introduced Hirschmann’s optical field bus, which is used for fail-safe transmission of protection and obstruction signals in the Swiss Lötschberg rail tunnel. The technical highlight of this route is the 34.6km long Lötschberg rail tunnel made up of two single track shafts. They run 40 metres apart and are connected to each other every 333 metres with traverse headings. The route has been fitted with advanced automation features, which specially apply to the energy supply for the whole tunnel facility. Here the safety-related control signals must be transmitted free of malfunctions and in real time between the operations centre and the relay rooms. The design uses Hirschmann's optical field bus technology to exchange protection and obstruction signals between the high voltage equipment distributed throughout the tunnel. 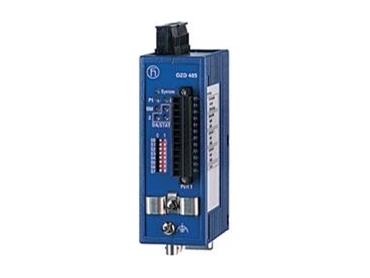 The Hirschmann model OZD 485 G12-1300 RS485 Electrical/Optical converters were chosen for their reliability in a harsh environment in terms of temperature and EMI as well as their capacity for forming a fast-recovery (50ms) redundant ring topology. The power requirement for the tunnel train traffic is 62MW in the current design and will be 116 MW for the potential full design with two fully navigable tunnel shafts. The power is fed into the tunnel in three places. The safety precautions for the high voltage equipment in the tunnel are important to protect people and equipment, hence the 132kV and 15kV rail power supplies have been divided into several segments with isolators, circuit breakers and load switches. The short circuit ampacity of the 15kV catenary chain system is 53,000A, but for no more than 100ms. Therefore, the switch-off systems are designed in such a way that they cut in after 50 ms. The rapid switch off system for the medium voltage network is also fundamental for protecting people because of the high earth leakage current and the pace voltages this causes. Because of the high currents that already occur in normal operation, data is transferred in the foundations of the tunnel shafts with fibre optic cables that are not sensitive to EMI. In all 355km of fibre optic cable with up to 144 fibres has been laid. ‘Areva’ distance protection equipment exchanges safety-related data using these fibres and Hirschmann fibre optic cable repeaters.